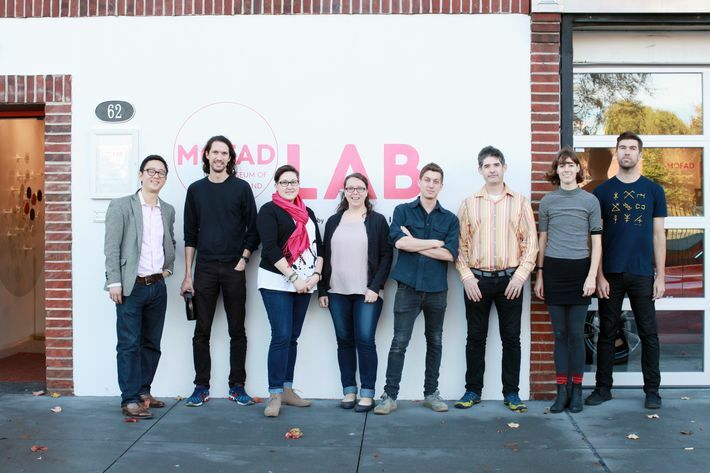 The MOFAD Lab opened to the public this week, with an exhibit all about real and fake flavors. 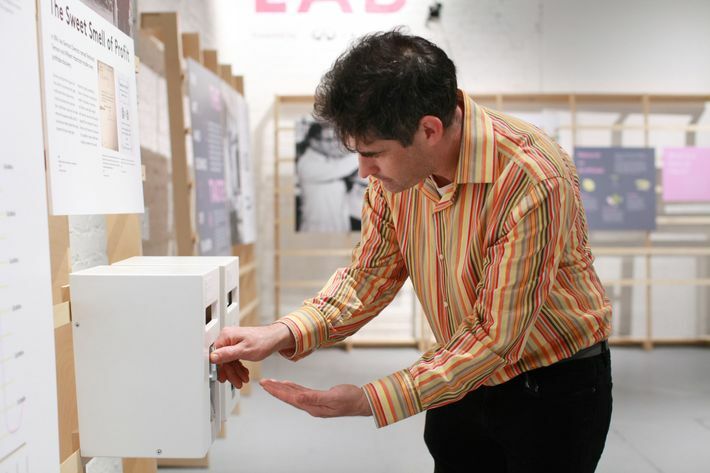 This week, the MOFAD Lab — the Museum of Food and Drink’s 5,000-square-foot design studio — opened to the public. 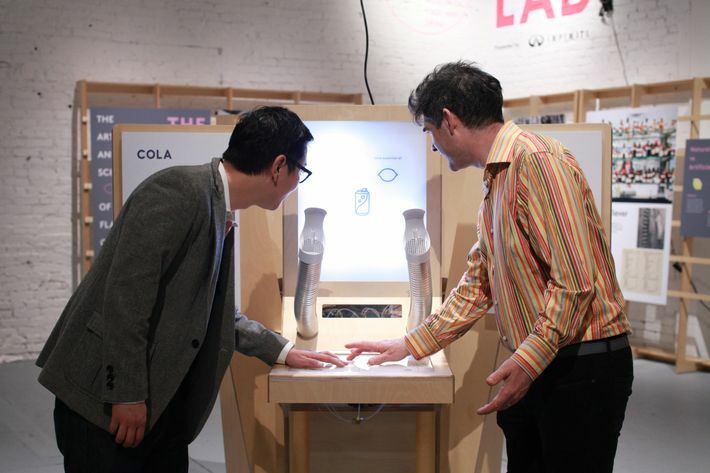 While the large-scale brick-and-mortar location of the museum remains in development, this space will host one exhibition at a time, and the first is called “Flavor: Making It and Faking It.” It’s a multisensory experience: You can read about the history of the flavor industry, use “smell machines” to differentiate between “natural” and “artificial” versions of scents, and learn about MSG and umami through tasting tiny tablets. As the founder and president of MOFAD, Dave Arnold (the same man behind Booker & Dax) has been heavily involved in each step of the planning — down to hand-building parts of the high-tech interface and writing code. We spoke to him about how he came up with the idea, why he thinks “natural” food labels are silly, and what he envisions for the next phase of the museum. How did you decide on the theme of the first exhibition? We were just sitting around like, “What should we do?” and a lot of us thought that it would be a good idea to deal with flavor, since that’s kind of our entryway into food, anyways. The problem is that flavor is such a huge subject that there’s really no way that we could have possibly tackled it adequately in this space. Also, it can become very scientific. So it became: What is something we can tackle in this space and really make a statement? What is something that affects all of us but that we don’t understand? Which is one of the reasons why cereal is one of the things we’re interested in. The flavor industry is like that, and it has an interesting history that can be traced back to a fairly distinct time period, and also that lets you have lots of fun stuff like these smell synthesizers. One of the reasons there’s so much information is that I want a little kid or an adult who doesn’t either know a lot or care that much about the subject to be able to walk in here and get something out of it. My kids will not read even two words — maybe two. It’s a tough balancing act. So we’re working on density of information. For every bit of text, we have some buttons you can push. Yes, and I like how you started by explaining the origins of vanilla, which so many people can grasp. It’s interesting how the flavor became so ubiquitous. At one point, we considered doing a whole exhibition on vanilla, and maybe someday we will, because it’s an unusually exciting story. It’s crazy. There’s a lot that we didn’t talk about because it wasn’t germane to our story, but it’s a product that was grown since forever ago in Mexico. It’s only pollinated by this wild Mexican bee, and when the Europeans first came, they discovered that people were using this product. Remember, vanilla on the orchid, it’s like nothing. You have to sweat it, kill it, ferment it, and then as it cures it becomes vanilla. It’s a complicated process. So, anyway, they discover this, they bring it back to Europe, and then no one could get it to grow. So it wasn’t really a domesticated plant. It was growing wild and harvested, but it wasn’t really domesticated. A slave in the island of Réunion figured out how to pollinate these plants. He died in poverty. In fact, he spent a lot of time in prison for stealing something because he was so poor, and a judge commuted his sentence because of what he had done for the vanilla industry. He started the vanilla industry. It’s fascinating. 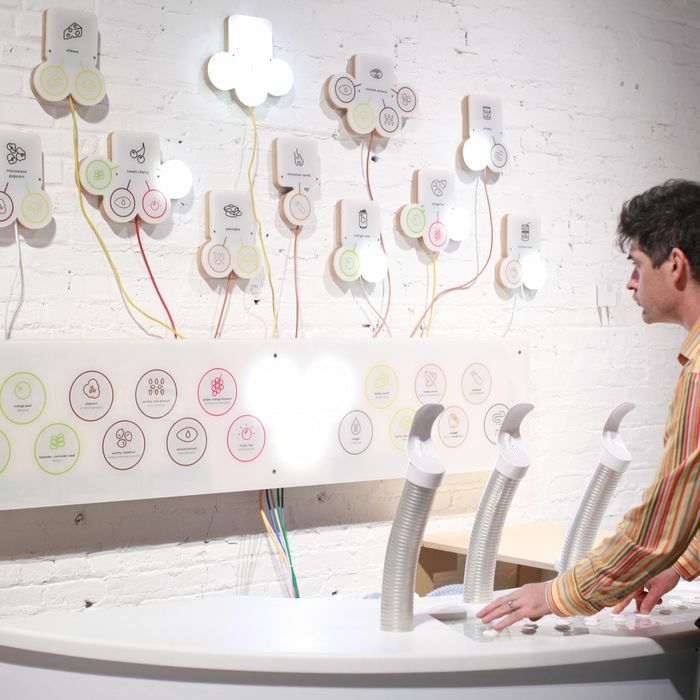 How did you break down which scents to use for the interactive part of the exhibit? What went into creating the technology? We wanted people to be able to play around with scents and smells. We looked at a bunch of different technologies, most of which were proprietary. Also, I’ve always been interested in certain things, like the fact that the components that make up a bigger flavor might not smell like the component that’s in it. The proprietary technologies were all fairly expensive, or they had long lead times, like we would need to get the aromas premade in Germany and shipped in. So we had a flavor chemist, who was our consultant on the aromas, put us in touch with Monell, which is a chemical sensory place down in Philadelphia. Monell has a system that they’ve developed that’s very simple, and I was like, “I got this. We can do this.” They sent us their list of what valves and stuff to use, but obviously I couldn’t leave alone, so I built my own interface for it. I built the board, and it’s completely open-source and relatively inexpensive. I didn’t want the interface to be like an iPad or like a computer — I wanted it to be like an arcade. So these are arcade buttons, like an old pinball [machine]. I wanted it to be super fast, responsive, and intuitive. And then we added these things, which are kind of like flower petals and this air extractor, which means that the whole room doesn’t smell like the buttons people are hitting. Yes, how do you contain the scents? This filter is developed for pot growers. Apparently, when you grow pot, there’s a lot of smell that goes along with it, so they need pretty good extractors that remove the smell from the air. There are pre-filters on the inside so that the air going through it doesn’t have an aroma. You seem so hands-on. How much trial and error was there? One big takeaway from this is how these massive companies end up co-opting flavors. Does this scare you? Or is it a positive step for the future of food? My view, personally — not the museum’s — is look, it’s not really possible to have the kind of industrial food system that we have today without the flavor industry. My main issue is that there are people who think that they’re acting out of this system by buying things based on labels like “natural,” and in fact they are not natural. Because if I wanted to sell a product that is natural or contains no MSG or has no added sugar or is lower in nitrates, for instance … It’s not that you’re going to get what you want, which is something that somehow has not been tweaked. You are just going to someone, somewhere, very smart who is spending a lot of time to make the product the way that you actually want it to taste when you buy it but with that label. So it’s going to be co-opted. Where do I sit with that? I don’t like the fact that people don’t know they’re not getting what they think that they’re getting. No, you’re not. One of the things in this exhibit is just to show that this is how the system works. So kombu contains glutamic acid. It just does. In fact, that’s how it was isolated and MSG was discovered. I was at a trade show once, and a person handed me some kombu dashi and she said, “This contains no MSG.” I just laughed. I’m like, “This is ridiculous.” This is getting a little philosophical, but prior to the advent of organic chemistry in the mid-1800s, one of the prevailing views was vitalism, meaning that the molecules that make us up as living creatures are fundamentally different from the molecules that make up the rest of the world. Things that don’t have life force get incorporated into bodies that do have life force. So there’s this kind of notion that chemistry is separate from what goes on inside of our bodies. The key discovery is that this is not the case: Chemicals in the world are the same thing as chemicals in us and in animals. The problem is that people actually, at heart, are a lot of time vitalists. They somehow believe that MSG that comes directly from the kombu is somehow different, and it’s not. But what is true is that even though it’s the same, a system that’s compounded from parts might not be the same. It’s definitely not going to taste the same because natural systems are more complicated. So if you taste the actual vanilla versus the vanillin tablets — most people, myself included, actually prefer the vanillin on its own. The real or the artificial nature of the component that you’re adding isn’t necessarily what people should be focused on. If they want something that has the full balance of chemicals in a plant, well, then eat the plant. There is nothing different between the specific molecule vanillin as it appears here versus as it appears in vanilla. People are really focused on “real versus artificial,” which goes way back to the 1906 Pure Food and Drug Act, and it’s just not the distinction to make. We should make the distinction between good and bad, from a quality standpoint. Or if you feel like there’s a health benefit to having whole plant foods, then make that distinction. But “artificial versus natural” is not helpful, because you can have a label that says natural, and it’s not what you think you’re buying. Again, we’re not here to tell you how to eat or what to think. We’re just here to show you and open a window into how the food system works. And beyond this, you’re still planning on opening a bigger museum. What’s the update on that? We’re super happy with this, but this is just showing what we can do with a brick-and-mortar space. A lot of people don’t know what they are going to see at a food museum. We’re keeping this space and this will be our lab, where we can workshop ideas, build exhibits, and then send them out. Then we hope to get a space that has three exhibits running at once. And then, ten years after that, maybe it’s eight exhibits, and then maybe 40 years from now it’s a museum the size of the Met. The subject demands it. But one of the things we do, and I harp on constantly, is always tackle a problem that you can do in the space you have. We didn’t try to tackle all the flavor with this. We chose a subject that we could tackle in the space that we had. And I don’t think you can ever tackle all of food until you have a museum the size of the Met. That’s why I think it’s exhibit-by-exhibit. So, if I had 10,000 square feet for a single exhibit, maybe we would talk about the brain. Another exhibit maybe this size or bigger: “Food on the Battlefield.” If we had a space that was permanent that we could put HVAC in, we’d have three kitchens running, and each kitchen would be from a different culture and a different time. And they would be running all the time, and we could swap them out. These are the kinds of things that we’re going to do. I can imagine you having a cool outdoor farming component, too. Oh, yeah. Well, right now we don’t have access to the roof space or the patio yet. There are a lot of gardens that we look to as inspiration. Cloisters has a lot of interesting gardens — not food-related, but it is kind of monastic. Monticello, obviously. You seem to be striking a nice balance between looking back at history and also into the future. Me, personally, in my normal professional life, I’m known for using new techniques and technologies. I’m a gadget guy, so I really need to guard against it, because we’re definitely not just a science museum, and we’re definitely not a tech museum. That’s my personal wheelhouse. And also, I like to throw a little razzmatazz into everything, and machines are razzmatazz. Everyone likes machines!